My BFF, the Tony to my Steve Rogers, the Holmes to my Watson, and the Kirk to my Spock made an interesting comment the other day about the concept of fairy tale stories and how people don’t really want a “fairy tale romance” in real life. She made the comment that when most people say they want a fairy tale romance/wedding/life they mean the Disney version. You know, the handsome prince/hero and the lovely young lady who defeat evil and live happily ever after with a bunch of catchy songs that follow them on their journey. The Disney Princess line follows has followed the formula with a lot of success, but Disney didn’t event the fairy tale so much as they figured out how to make bank off of retelling them. I mean, have you ever actually read a fairy tale? I’m talking the original brothers Grimm sort of thing where the penalty for not winning the princess’s hand was death (“12 Dancing Princesses”) and the step-sisters cut part of their feet off to try to shove that coveted glass slipper on their feet (“Cinderella”). Those stories are full of some pretty dark stuff. The Disney version was neatly adapted to a family friendly G version because no six-year-old girl wants to know how the original version of “The Little Mermaid” ended (although they have no qualms about killing off mothers as many of us have noticed). I’m really hoping that people don’t want all of that death and violence in their relationship, because otherwise, I’m going to be concerned. Like seriously. So here’s to having relationships that aren’t fairy tales. January brought the return of one of my favorite guilty pleasures. i speak of the updated version of Dallas of course. The show that created a phenomena last summer that I still describe as “John Ross feels.” i was thinking about how the show crafts it’s more villainous characters the other day, mostly because I had an upcoming class on writing villains. the one thing I already know going into the class is that villains should be complex as well as the hero of their own story. I’m trying to remember where i heard that phrase from, but it makes sense to me. Dallas really brings that out I think, especially with John Ross Ewing. John Ross earns sympathy because his romantic life is pretty screwed up. He will always be second place to the girl he really wants. His childhood was a screwed up mess because let’s face it, being the son of the infamous J.R. does not lead to stability in anything non-financial. He will always try to please his father who has an agenda all of his own. Of course he is a villain, and he’s willing to use black-mail, law breaking and all sorts of dirty tactics to get his way. But last season, when he was accused of splitting up his cousin’s relationship with Elena and framed for a murder he didn’t commit, you felt for him. Even as he’s plotting to take over the family property, you know he’s not all bad. When he screws up and looses Elena, you don’t blame her for leaving, but you kind of do feel for him. You don’t want him to destroy the more sympathetic characters, but you start to get why he’s so ticked off about the hand the universe dealt him. When he goes to the dark side and asks his daddy to teach him to do things the J.R. Ewing way, you’re kind of sad to see him give in. At the same time, he is so wickedly charming, good looking, clever and cheeky that you enjoy him as a villain and sometimes, you like seeing him get the victories that he does. John Ross is a scene stealer and with the passing of Larry Hagman and J.R. both, he’s going to be on deck in a big way. Any villains out there that you love to hate or even love to love? I have promised myself that I am going to talk about other geeky awesome things on this blog. I am not giving up the writing, I’m just adding subjects. This is an aspiring author’s blog, I want a recording of my journey towards publication. If I can get there, I think it could be helpful for other aspiring writers to see what I did. However, I want to give the world of an idea of me as a person too. A big part of that is my geeky personality and love of collectibles. I swear the Phoenix Comic Con merchants become more dangerous by the year. ThinkGeek.com and Entertainment Earth are so, so dangerously awesome. If you’re reading my blog, you likely know what I mean. I’m not lucky enough to own something that came out of an auction (although I did meet the proud owner of one of the Captain America propaganda posters, so jealous), but I have some items I really adore. 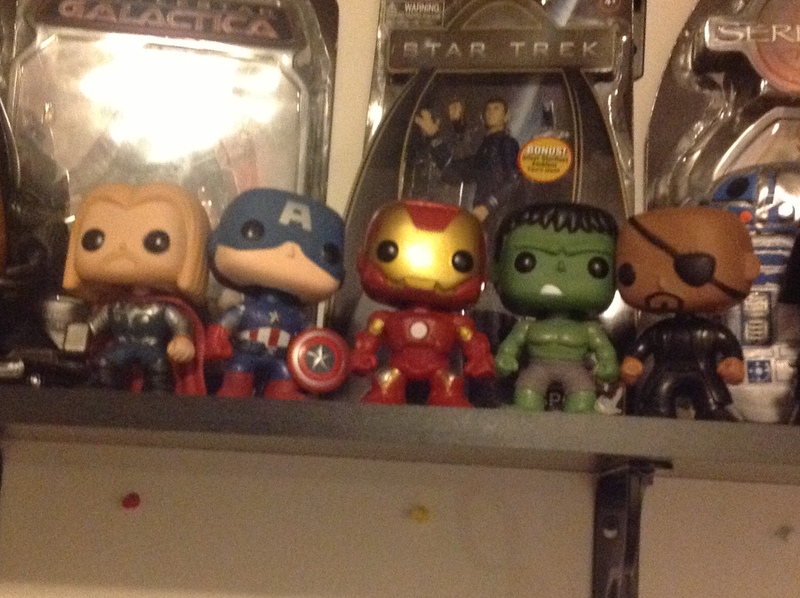 My Pop Vinyl Avengers! So cute! One of my favorite makers of cute collectibles is the chibi style Pop Vinyl Funko line. For fandom items, they aren’t as expensive. Unless you want one of those Comic Con Lokis and are prepared to hand over your first born child, (don’t worry geek child, Mommy won’t trade you for Loki, she’s a Captain America girl). They don’t take up as much space as some things and I think they are just all adorable as heck. I have been given a lot as gifts and the next wave of Game of Thrones ones that release are going to cause a little ding in my wallet. My favorite bigger gifts include the Mal Reynolds replica pistol I have. Perfect for space cowboys who come wearing awesome brown coats and a fondness for cheeky one-liners. I really need to find a shadow box to display it in. As a fan of Mr. Fillion and his support for kids reading, I am also the proud owner of one of his “Read” posters with his mighty fine signature. Being the Avengers fangirl I am, I was thrilled to get a set of the Agent Coulson Captain America trading cards this Christmas. I squeed so hard. bow. Anyone out there have a love of awesome collectibles or are you coveting something geeky and cool?